Two robots are trapped in a factory and need to find the exit in 28 platformer stages to get a wonderful "Thank you for playing!" picture. When I tried to start the game, it wanted me to use the Wii U GamePad. The game simply wouldn't boot up with just a Wii U Pro Controller or Wiimote registered, and I thought, well, this could be a nice original game in which the GamePad's second screen is needed and used in an innovative way, but alas, it's not. It just forces you to use the GamePad when every other Wii U compatible controller would do the same job. So, after giving the GamePad some juice I was able to boot it up. I was also joined by a friend because the game can be played with 2 players in splitscreen. No, there's no way one player can use the tv screen and the other can use the GamePad screen, it's always the good ol' vertical split screen. The GamePad can mirror the tv, but other than that it just shows a picture with the controls. Note that there's no sound coming from the GamePad if you want to use it as your main screen. There really is no need to force the GamePad upon player one. Also, the second player has to use a Wiimote (held sideways), no other controllers are supported. Now that we connected the controllers the game was programmed for, let's have a quick look at the options menu where we will find bars to change the screen size, brightness, music volume, and sound effect volume, pretty standard stuff. We changed the brightness a bit because the game seems a little too dark. Getting into the game you're greeted with a level select screen. Obviously only level 1 is available at the beginning. Other than that there is a top 3 local leaderboard for each stage showing your best times. A nice touch is that you get separate leaderboards when playing in co-op. But you can't put in your name or initials. It's just for personal speedrunning. So let's check out the game! The first level is a tutorial of sorts. It starts with a graphic showing your controllers and what the buttons do, and a short description of what is just happening: one of the robots is in a small death chamber, with the ceiling descending slowly. 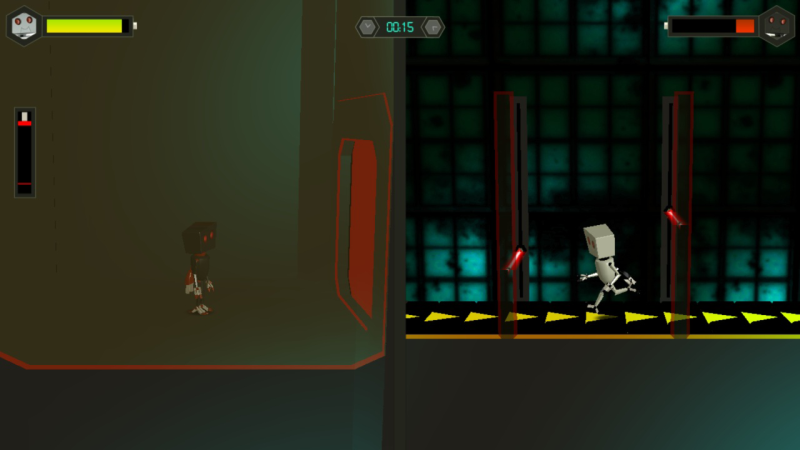 He cannot get out without the help of the other robot that is next to this chamber, free to roam the 2D stage to free his buddy from his unfortunate fate. A pop-up message explains your goal: "Find RED BUTTON to open RED PRISON DOOR" so your friend can escape before the ceiling crushes him. Until you find the red button, the other robot can do nothing. This is how every level starts. At least in two player co-op the robots switch places every time you fail (or win), so every player has to play the waiting game for one turn (which isn't very fun). 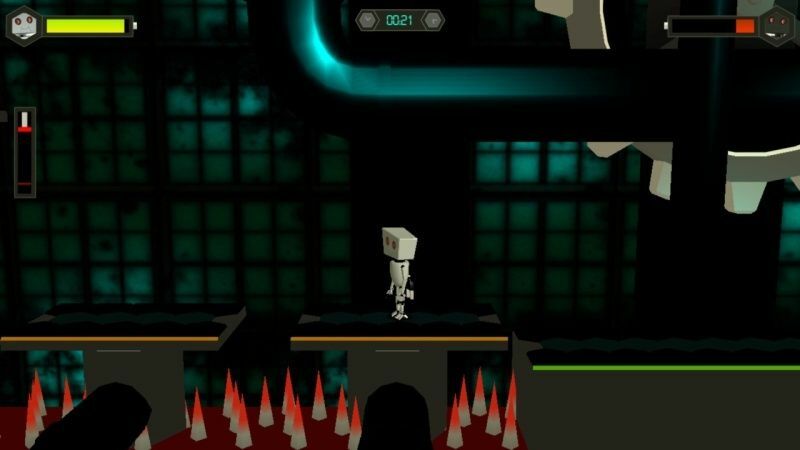 In single player you switch between robots anytime by the press of the Y button. Let's find the red button so both robots can finally play together. It's standard platformer controls - you can walk left and right and jump with the A button - and for the most part they do what you want, but there's also a twist as every action (walking, jumping, hanging onto ledges) consumes your battery life. Use it up and the robot's dead. Before that happens, you can recharge your energy by running over certain blue dotted platforms or by finding a golden battery (there are no collectibles, it's just an item). If there's nothing to recharge yourself, there's always a last resort mechanic: a robot with more energy should hold the X button to transfer his own battery energy to his friend. 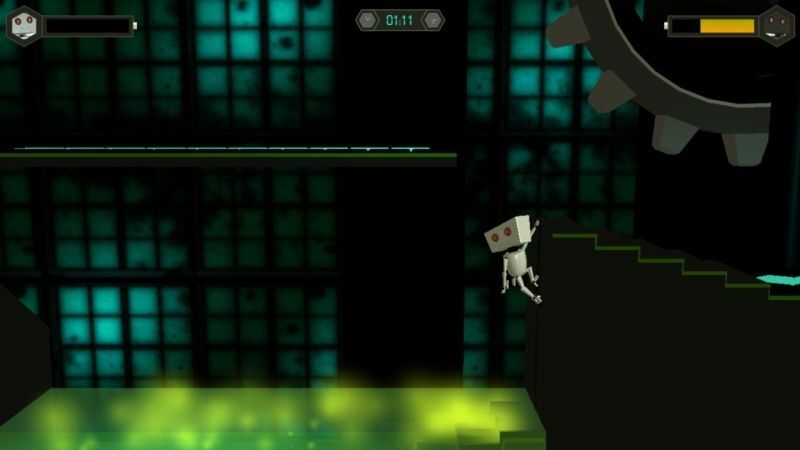 In single player the other robot automatically receives the energy, but in co-op both robots have to hold the X button or the energy gets wasted. Also, every level has an exit door that you have to open by charging a generator with your own battery life. Obviously you need to save your battery life to have enough power at the end of each stage to open up the last door. Sounds quite original, doesn't it? However, the level design is not. It's basic platforming with all the generic traps you've probably seen a million times before: life consuming laser barriers that go up and down, acid pools, collapsing platforms, instant-death spike pits and crushing ceilings, or even more frustrating: pits that you cannot get out of so you have to pause and restart. 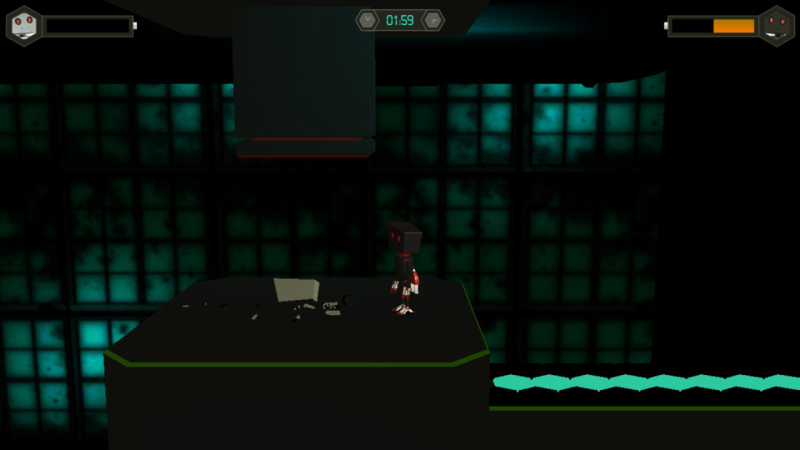 The levels are of moderate size, but it still can be a challenge to find the red switch or the exit door in a few of them. Extremely slow moving platforms and elevators (that involve more waiting) are not fun. Ocassionally you can trap yourself in slides or push boxes into the wrong direction blocking your path or making some switch puzzles unsolvable. In that case restart will be your friend. All of this comes in grey shaded colors and there's not very much visual variety to spice things up. One of the bigger problems I found is that you really don't need the second robot most of the time. There's just a couple of stages where he's really needed. In general you can just get to the exit with one robot and let the other one die. The only penalty is that your time will be doubled. You still unlock the next stage so as long as you don't speedrun the game for best times you don't have to worry about your buddy dying. Twin Robots is a rather generic platformer with just a couple of minor original ideas that are unfortunately not balanced enough. The 28 stages can be beaten in a couple of hours and the reward is just an ending picture. Speedrunners can get some replay value out of it but all said and done it's just a mediocre experience compared to other platformers on the Wii U eShop. I deleted it accidentally, hit the wrong button, but it's back. @SKTTR is this similar to Chibi Robo Zip-Lash? If you expect the same quality in content, charm, graphics, music, controls, design and gameplay that you can find in Zip-Lash then you'll be disappointed with Twin Robots. Twin Robots is frankly, worse in almost every regard - BUT that's to be reckoned with when comparing a one man studio indie game to a similar, big Nintendo game. And I say "almost" because Twin Robots has two things that are better: it has a 2p co-op mode (even though its design could use some tweaking) and it runs at a higher resolution (but in terms of graphics a proper art style, animations, and variety are more important than resolution). What will you be reviewing next? This sounds bad so I'll pass. The reviews for Bit Dungeon+ and Buddy&Me - Dream Edition are coming soon.